Cute European girl feeding birds from hands. Slow motion. 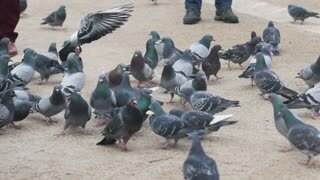 Big flock of pigeons catch seed. Happy little female kid. 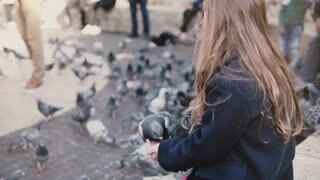 Girl Feeding Pigeons. Hesitatory and Timid Bird. Family feeding flock of pigeons on town square. HD 1080i. 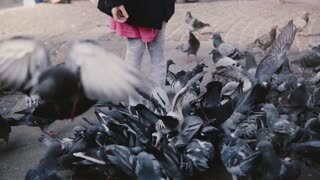 Little European girl feeds pigeons. Slow motion. Happy cute female kid feeding birds on sunny city square. Childhood. Birds sit on little girl's arms and eat. Slow motion. Beautiful kid feeding several city pigeons from hands. Peace. Little Caucasian girl sits feeding birds outside. Slow motion. 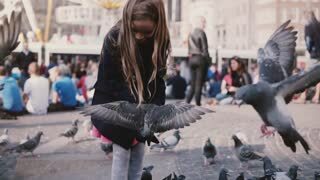 Happy female child feeds pigeons in the street. Peace. Little Caucasian girl feeds birds outside. Slow motion. Happy female kid feeding pigeons on crowded sunny city square. Birds try to eat from little girl's hands. Slow motion. 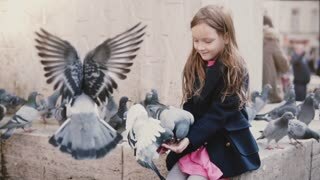 Child feeding two pigeons on her arms, flock in the background.